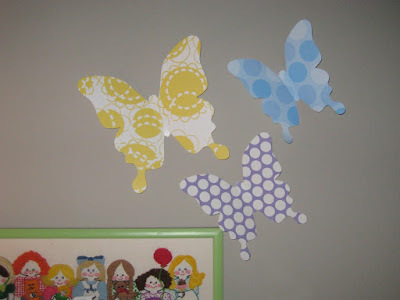 This week I made some butterfly decorations that closely resemble the original pottery barn kids butterflies that I was given at a baby shower for my 14 month old. I have realized that 14 month little girls really LOVE butterflies and will grab them at any and every possible opportunity; so now I need to replace a few torn wings. The first thing I did was grab some scrapbook paper. The paper I used was 8.5" x 11". 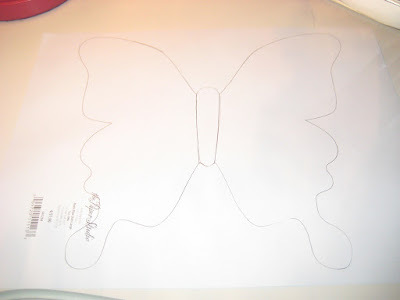 I traced one that I had laying around; but if you wanted to make one I would start with a long skinny oval in the center of the paper. Next draw a wing (maybe on another paper and cut it out) Then trace that wing onto your oval and turn wing over and trace the other wing. Cut out. 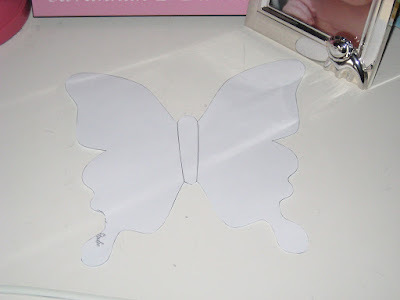 Now that you have your butterfly cut out; fold along the oval lines. This will make your butterfly "fly". 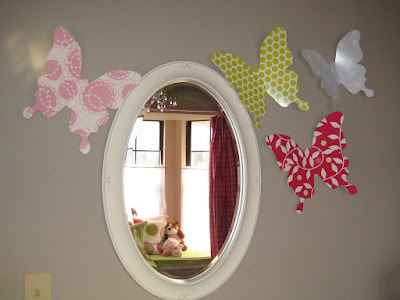 Place double-sided tape along the back of the oval and stick on the wall.